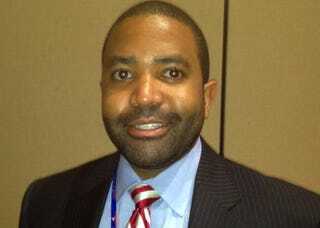 (The Root) — At the Republican National Convention in Tampa, Fla., on Wednesday, The Root briefly caught up with Jonathan Burks, deputy policy director for Mitt Romney's campaign. He sat down with us for a conversation about his candidate's views — and how Romney differs from President Barack Obama. In a wide-ranging discussion, Burks brought up the "legacy of discrimination" and the need for "better education" as root causes of employment gaps for African Americans. Burks touted Romney's "premium support" plan for Medicare as an alternative to Obama's Affordable Care Act, and said "there won't be any benefit cuts" — for those over 55 now, or for "future seniors" 54 and under. This, despite most interpretations of the Romney-Ryan approach, in which premium support — called "vouchers" by Democrats — would pay for a portion, but not all of seniors' health care costs in the future. And he said that when it comes to the Affordable Care Act, "the more people learn about it, the less they like it." Here's what he told us about the health care law, Medicare and black unemployment. The Root: What policies do you think Gov. Romney offers that might draw more African Americans to him as a candidate or to his campaign? Jonathan Burks: Well, I think the number one issue for African Americans, as it is for every American, is jobs and the economy. I mean, the African-American community has been hurt worst in the recession and the lackluster recovery, so the message that the governor brings on how to get the economy back on track, how to expand jobs, how to expand the middle class, is a message that's very appealing to African Americans. TR: Do you have any response to the notion that African-American unemployment not only is higher now than the national average (pdf) but also has historically been higher than the national average? JB: Yeah, I mean, obviously there's a long legacy of discrimination that is part of the reason African Americans have traditionally had a higher unemployment rate than other Americans, and that's something that, you know, you've got to address. You've got to address it through education, you've got to address it through fair employment laws, but at the end of the day, you've got to expand the economy so that there are more jobs, period. And through better education, you get it, so that the African-American community benefits and can get back to where it belongs as far as being on par with all Americans. TR: One of the major policy differences right now between Gov. Romney and President Obama would be the Affordable Care Act. In polling, more African Americans favor the ACA than don't. How do you think Romney can address that issue in terms of trying to convince African-American voters that he has their interest in mind, given that he's called for a repeal of the ACA? JB: I think, really, the more people learn about [the ACA], the less they like it. For a lot of people, they don't understand that in fact it has cut $716 billion out of Medicare, and African Americans who are retired are more likely to be fully dependent on Medicare plans. TR: Is the critique that it has cut $716 billion out of Medicare budgetarily — or is it that it has cut benefits? What benefits are you addressing that have been cut? JB: Well, you know, obviously the law says we're not going to affect benefits, but at the same time, the nonpartisan Medicare actuaries who work for President Obama have said that one in seven hospitals is going to go out of business and stop accepting Medicare patients because of those cuts. They've said that you're going to have fewer doctors accepting Medicare patients because of those cuts — and so that has a real impact on benefits. It's one thing to say everyone's still eligible for a certain level of benefits, but if there are no medical providers willing to accept Medicare as their form of payment, that has a real impact on today's seniors. TR: And if Gov. Romney becomes president, and his current plan is implemented, will there be no benefit cuts? JB: There will be no benefit cuts. We will restore the $716 billion to Medicare, and so you won't have hospitals and providers going out of business and refusing to accept Medicare patients. TR: And that's now and in the future? JB: Yes. No changes for today's seniors, so anyone who's 55 and older, we would restore the $716 billion to Medicare and make it so that the system is whole and intact for those who are [currently] in the system. And then, for those who are 54 and younger, we get a changed system, that introduces choice and competition — so that you have a program that's actually fiscally sustainable for the long term. TR: So you're saying there will be no benefit cuts for people who are already above 55, but there will be benefit cuts for people who are younger when future changes are made? JB: No, actually I'm saying there won't be any benefit cuts, period. For those who are 55 and older, there are no changes in the system at all. For those who are 54 and younger, we'd change to a different kind of system. JB: Yes, premium support. Yes, where Medicare — fee-for-service, today's Medicare program — is one of those options. So you'd still have the same access to the traditional Medicare system if that's the choice a future senior makes. TR: So the issue isn't benefit cuts? The issue is more premiums? JB: The issue is how do we make this program more sustainable so that — you know, right now Medicare's actuary is saying that the program is going to go bankrupt in 12 years. And so if we don't make changes to the system, then you're going to have a program that doesn't exist for tomorrow's seniors. So what we want to do is restore the $716 billion so today's seniors don't see medical providers going out of the system, and reform [the system] for the long term so that future seniors have a program that's actually in place. David Swerdlick is a contributing editor for The Root.